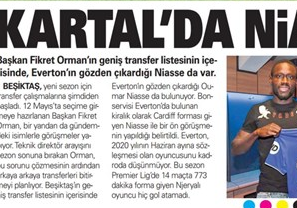 Aksam report Besiktas president Fikret Orman has identified Everton’s Oumar Niasse as a summer transfer target after the Istanbul side were also linked with the player earlier this week. The Turkish newspaper claims Orman is looking to bring in a forward this summer and it looks like Niasse is an option for the Black Eagles. Niasse, who’s currently on loan at Cardiff City, is expected to leave Everton in the next window and Aksam report the Premier League side are actively looking to part ways with the Senegalese striker. It’s also reported Besiktas have held initial talks with Niasse and according to Aksam the meeting was very positive. It’s been well documented in the Turkish press that Besiktas president Fikret Orman is looking for a strike partner for Burak Yilmaz and the Super Lig club have also been linked with a move Everton’s Cenk Tosun. Niasse has yet to score a PL goal this season and his contract with Everton will expire in June 2020.